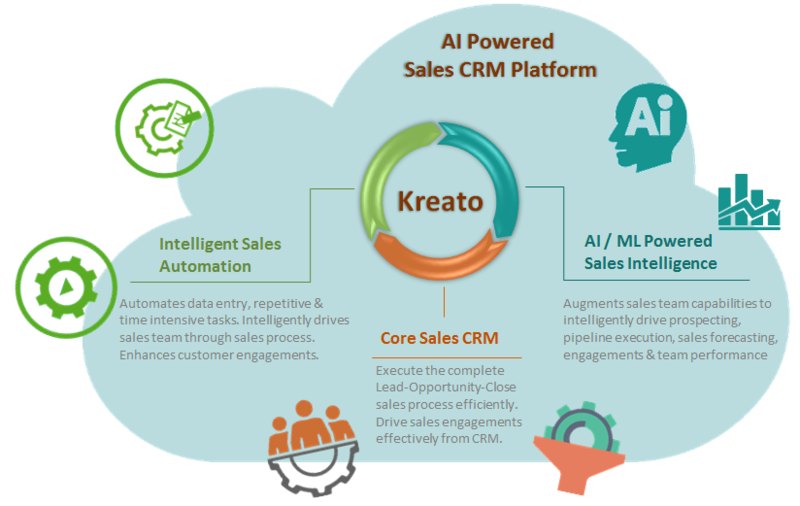 Ready to see how Kreato can help your business to grow sales? Automates data entry, repetitive & time intensive tasks. Drives Sales Team Intelligently Through Sales Process. Auto guide sales reps on next priority activities on their assigned pipeline. Auto detects sales activities including mails, calls and updates itself. Discovers and adds rich layer of information to customer profiles automatically. Auto captures new leads from web forms, landing pages, emails, calls, chats & more. Auto distributes new incoming leads to right sales reps using intelligent mechanisms. Auto assigns tasks to sales reps based on pipeline events and state changes. Detecting intent of the incoming email, Kreato frames reply on your behalf. 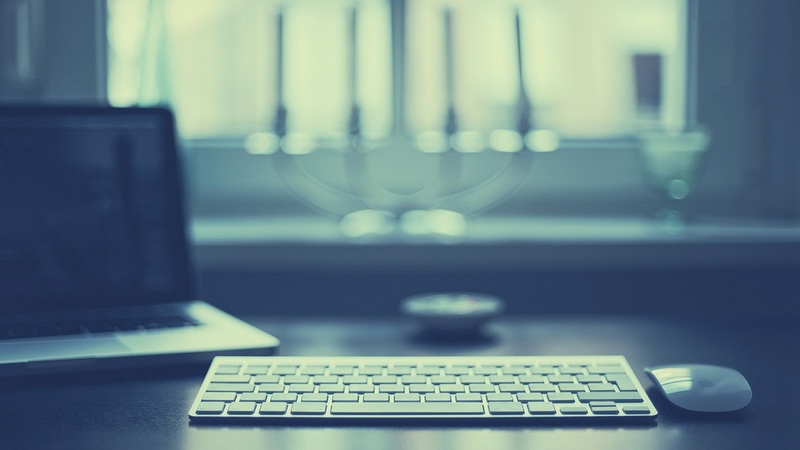 Recognizing activity requests in the email, Kreato reminds to schedule follow-ups. Auto detects new contact details in incoming email and proposes to update records. Be productive on the go with Kreato. Native Mobile Apps available for IOS & Android Platforms. Augments Sales Team’s Intelligence Throughout the Sales Process with AI driven Predictive Insights and Prescriptive Suggestions. Prioritize & focus on right leads and deals with scientific scoring techniques. Pin-points deals in pipeline that are stuck or at risk and suggests corrective actions. Get right forecast projection with predicted deal closures & probability techniques. Optimize customer engagement with predictions on best time & channel to reach. Identify team performance bottlenecks & address them with recommended measures. 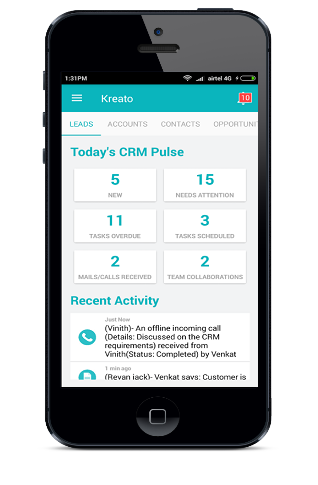 TRY KREATO CRM FOR YOUR BUSINESS. We offer 15 days full featured free trial with no obligations. Reach more prospects. Engage intelligently. Acquire more customers. 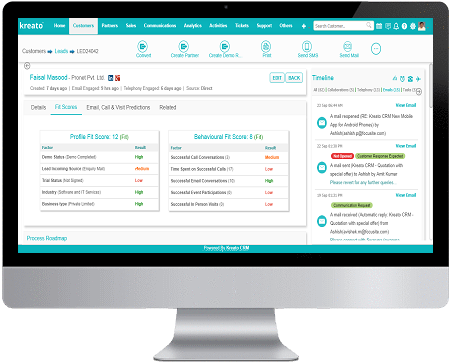 Email customers from within CRM. Use templates for consistency. Track opens & clicks. Make calls from within CRM with auto logged call recordings & text transcriptions. Text customers from within CRM for transactional updates and reminders. Auto trigger email responses to customers based on specific actions or pipeline progress. Auto send successive set of personalized emails to customers at pre-defined schedules. Schedule pre-drafted emails to customers on the best probable time they read.